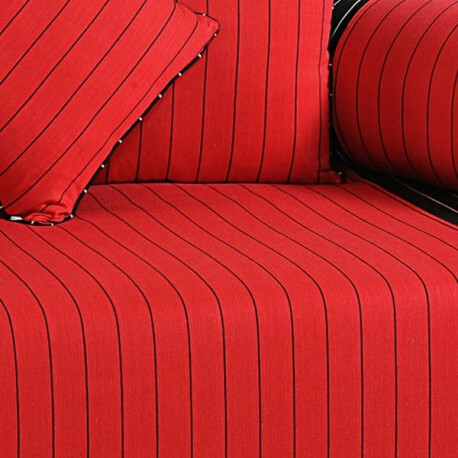 Detailing of red with the black edges gives a new and colorful touch to your home. Let the shade immerse you in love and passion. The color depicting life will breathe in freshness to your décor. It will tuck you in and direct you to the bliss. Enrapture your thoughts and feeling with the extra cushion and bolster covers. Cotton striped cushion covers not only give your home the sophistication and beauty but also keep you reposed with the cotton finish. Maintaining the aesthetic stylization with even the most common color it beautifully mesmerizes you. Rich shade of the sheeting gives it a very majestic look and feel. With the contrasting colors and impeccable designing it will let you enter the new era of distinctiveness. Bring out the gorgeous sheeting which will add value to the entire interior decoration. A stupendous spread to welcome guests in the festive season will be ready to gather all the compliments. 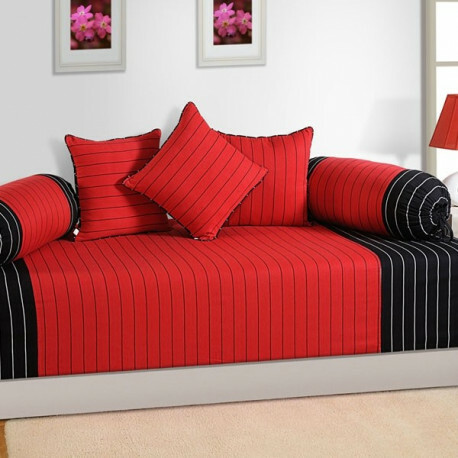 Buy Red Romance Linea Diwan Set which will instruct your bedding with cottony reassurance. Impart sensitivity and soulfulness with the glamorizing spreads. With the renditions of linear lines it gives a modern and urban designing. Cotton striped cushion covers makes the whole new world of chic. 100% buy back within 30 days of delivery will ensure your hard earned money. Cotton fabrication provides you with breathability, weatherproof, and durability. It will make you feel contented in the winters as well as in the summers. High thread count will ensure high quality and softer feel of the fabric. Yarn dyed fabric will not only make the sheeting look rich and vibrant but also will pass on strength and firmness. Machine wash gives an ease of handling and treatment. Leave behind the cumbersome days when you had to take time out for dry cleaning of spreads. 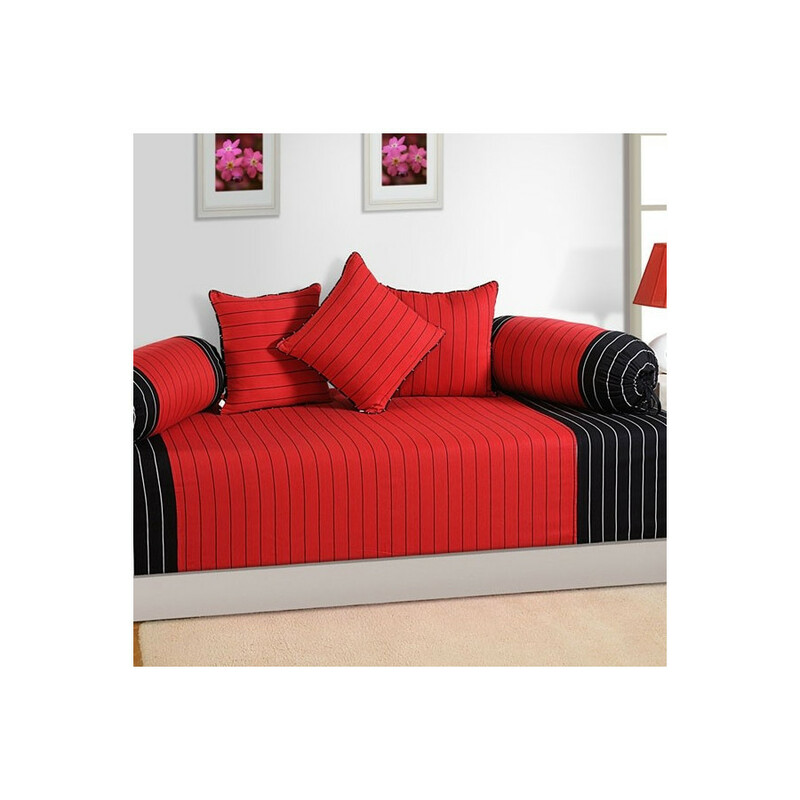 Buy Red Romance Linea Diwan set from swayamindia.com and let the tint prettify your home. Luxurious finish will give your dwelling a new and refreshed look. Reasonable pricing will make them even more alluring and interesting.